A few weeks ago, I took my kiddos to Typhoon Texas—one of the best waterparks in the state, just outside of Houston. It was my first time there. I was floored. Typhoon Texas is a supremely well-oiled machine that can teach Web designers (like me) a thing or two about crafting a smart user experience (UX). At the food stalls and gift shops, there is practically no wait—and not because people aren’t buying, but because the park has made the sales process seamless. Each guest wears a simple bracelet, embedded with an RFID (radio frequency) chip that’s linked to the guest’s credit card. No more running back to a locker for money. Simply wave your bracelet above the sensor, and boom, you’re on your way. Evan Barnett (Typhoon Texas’ General Manager) and Ty Weitzel (Director of Operations) explain that the park even tracks, in real time, where guests are spending money throughout the park—thus allowing them to deploy additional staff where and when it’s needed. This improves the guest experience by ensuring a consistent staff-to-guest ratio and ensuring that whatever the guests wants to buy is readily and easily available. Typhoon Texas is always attempting to anticipate their guests’ needs. The park has installed shade sails to ensure guests waiting for a ride don’t melt in the Texas sun. They’ve laid “water walkways” so your bare feet don’t burn on baking concrete. They’ve divided the park into different areas based on age, so everyone has a place to safely play. 1. The park has removed friction from the guest experience. 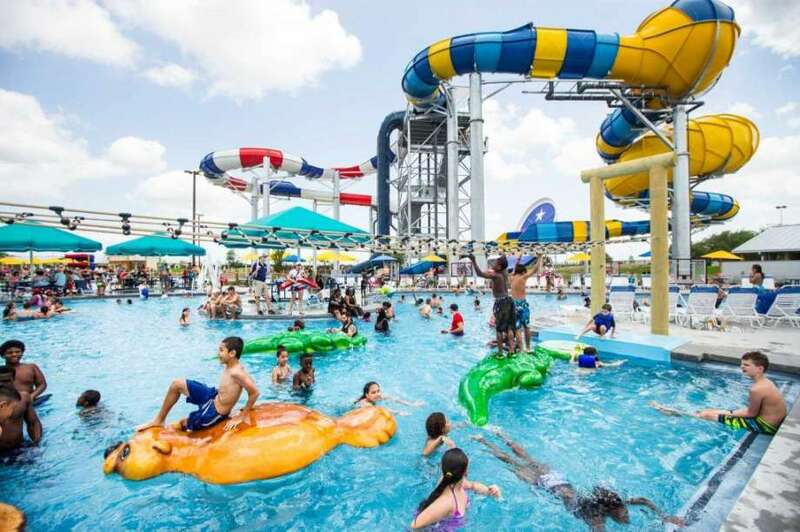 The waterpark’s RFID wristbands make purchasing as easy as possible for its customers. Similarly, Web designers place important calls-to-action (CTAs) front and center—or wherever users are most likely to encounter them. Web users want to find their desired information quickly and digest it in a way that is understandable (and probably a little entertaining). But what about delivering Web content that users don’t even know they don’t know? How do we help them “discover” information they didn’t realize they wanted without causing friction? Often, we use a “bite, snack, meal” approach to this common challenge. The idea is: If we can get users to take a bite of content, it’s much easier to convince them to travel a bit deeper into your site (the “snack”). And if we really surprise and delight them, they’ll go for the full meal (usually some sort of interaction). But if we overwhelm them with content too early—if we make them feel like the website is gonna be work to use—they’ll leave your site in a blink. 2. The park tracks its users’ behavior. Which food counters are growing in popularity? Which are being ignored? Which gift shops are running out of floaties? When will they need to be restocked? Which rides are experiencing long lines? Answering these questions—and dozens of others—helps people like Evan and Ty make both short – and long-term improvements to the park. In the same way, UX designers like me loooooove Google Analytics. It allows us to ground our design decisions in reality, in quantifiable data. We can see how users arrive at the site, where they go, where they don’t, how long they stick around, which specific actions they’re taking along the way, etc. Once empowered with this data, the question then becomes: What now? What can we do, as designers and information architects, to help user behave the way want them to behave? That’s where the insights of a skilled UX designer can make a world of difference to your website. 3. Typhoon Texas anticipates its users’ needs. You have to genuinely care for your users. If you care for them—if you aim to meet their needs and desires—you’ll begin building a truly human factor into your online identity. It’s not about you. It’s about them. Use your professional insights, along with your robust Google Analytics reports, to transform your website into a living, breathing, dynamic resource—a tool being constantly adjusted to meet your users precisely where they are. 4. The park is constantly looking for ways to improve the guest experience—even in little ways. Typhoon Texas is wildly popular. They could implement zero additional improvements to its guests’ experience and continue to reap a hefty profit. But they continue to seek out enhancements to the guest experience because (a) it’s the right thing to do and (b) they know that users can be fickle. If Typhoon Texas rested on its laurels and didn’t seek out innovations, eventually guests wouldn’t find the park as delightfully novel. Eventually, they’d come less often, and eventually, the profit would begin to dip. When designing a website here at TradeMark Media, we keep an ongoing “wish list”—i.e., a list of tools, features, and design elements we’d love to add to the website at some point. It helps us move from a website launch directly into a new round of improvements. We also perform all sorts of user research (including surveys, interviews, usability testing, card sorting, persona development, etc.) to ensure that the website we design directly supports what its users actually want. Many of our clients, in fact, are part of our retainer-style Partner Program precisely because they want to tackle their wish list in agile, nimble, month-by-month mini-projects. Constantly seeking out new ways to delight and engage your users helps stay enamored—and keeps them coming back. Is Typhoon Texas perfect? No. But is Typhoon Texas committed to constant improvement? Absolutely. Go forth! Create a great experience for your users! Tackle improvements one day/project at a time! Your users will have a wonderful experience—and so will your business! Happy and safe adventures this summer, and I hope you all have great experiences in your future.